A while back, my Scottish Stepfather gave me a very strange kitchen utensil. I'd never seen one before and, frankly, it was slightly terrifying with it's circular-saw bottom and unforgiving teeth. 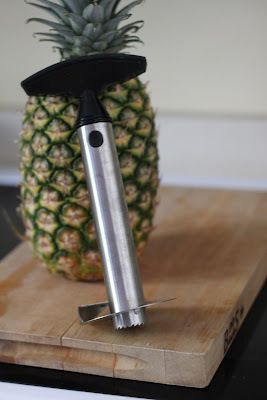 He explained that it was a pineapple core-er and that it was THE BEST way to cut a pineapple. When Marc and I took the hour-ish drive to Saint John's Costco on the weekend, they had $2.99 pineapples! In April! I did the ole pull-the-leave-out trick and, lo and behold, they were ripe! 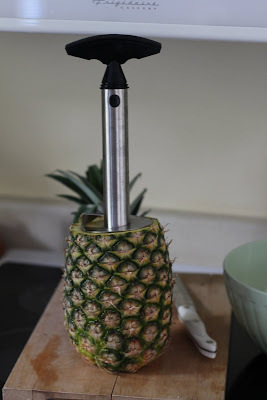 I have an AMAZING pineapple-curry chicken recipe, so in the cart it went. 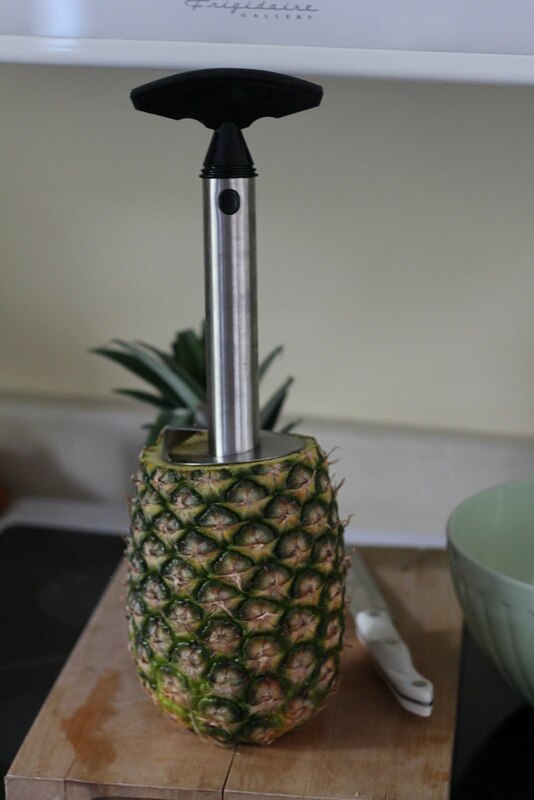 When we brought it back home, I rummaged around until I found the AMAZING pineapple core-er. As you can see, it's just about as tall as the pineapple, which is pretty crucial. You'll see as the pictures progress. The second step (the first being the actual FINDING of the core-er, it's not every day that I need it...) is cutting the top off and then shoving in the toothed-bottom as hard as you can. Oh, also, you want to make sure that it's as centred as possible. 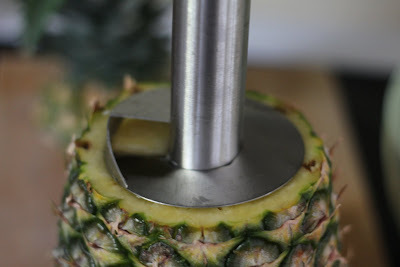 While pressing quite firmly, turn the handle and push down. After a few turns, you don't have to push as hard, but still keep the pressure. 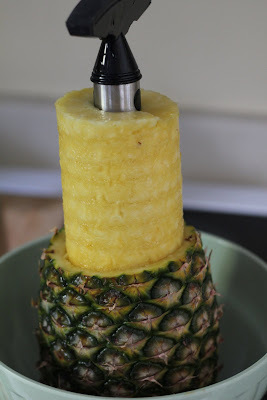 Do this until the black dot is just at the top of the pineapple. Then SPIN the handle WITHOUT pressure in order to sever the bottom of the spiral. As soon as it's cut, you can feel it. Then pull out SLOWLY. 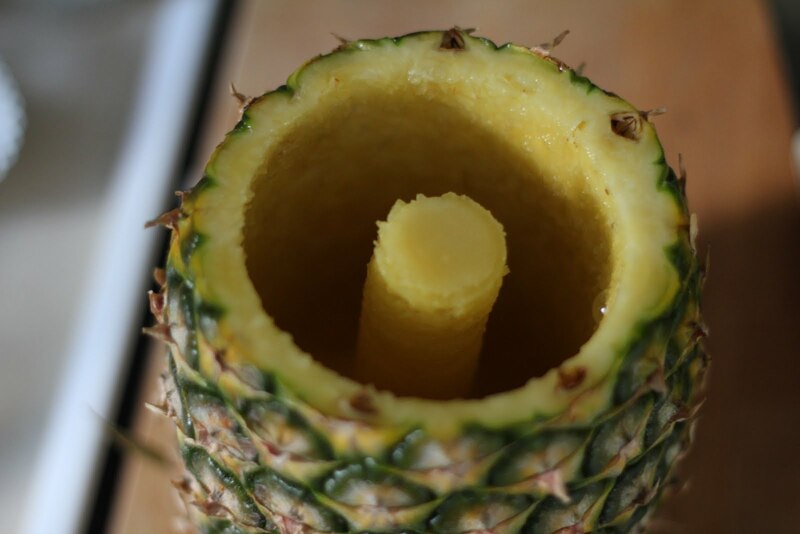 Oh, and make sure you're doing this in a bowl because if the core-er isn't totally centred then you can puncture the outside and get juice EVERYWHERE. Is speak from personal experience. This is what you're left with. A craftier person would probably incorporate this into some type of food display. I wasn't in the mood. Ooooo, spiraly. I like to cut it into chunks while the spiral is stacked. It's easier. 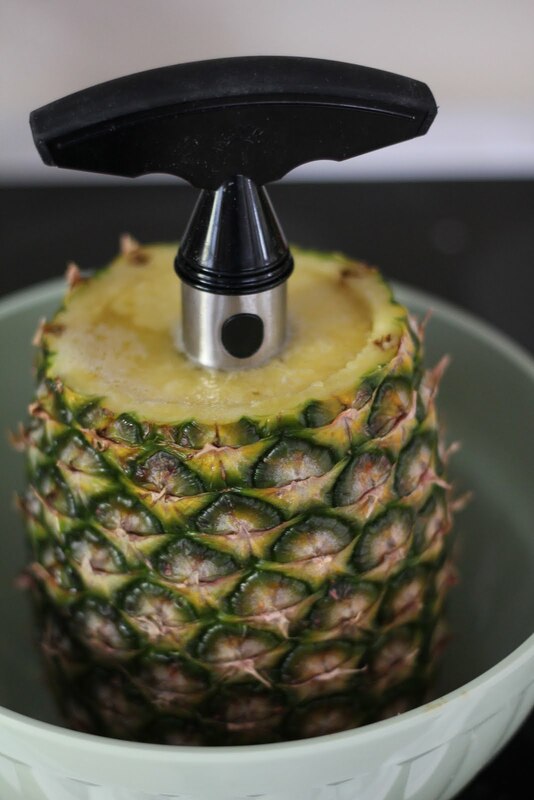 Whoever invented this is a GENIUS. So there you go! That whole process took less than THREE MINUTES!! 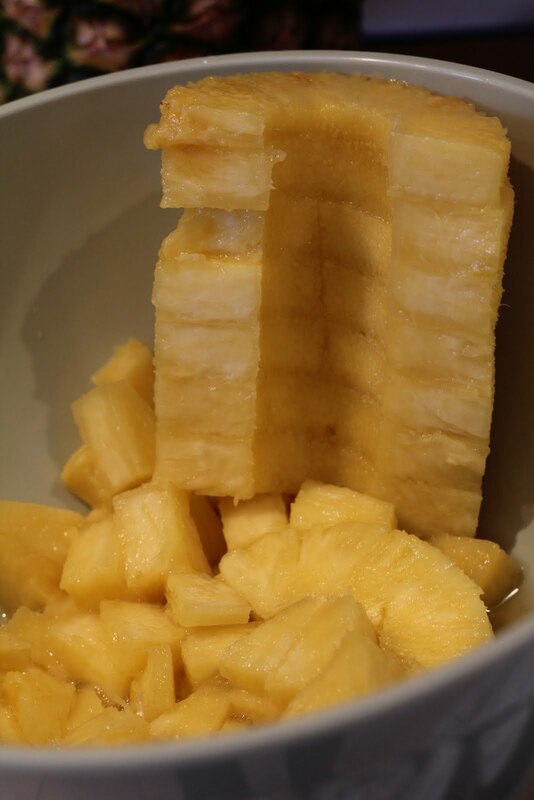 No fuss & no muss, just delicious, juicy pineapple. If you're a pineapple enthusiast, I'd TOTALLY recommend getting one of these. I have no idea where Scottish Stepfather got it, but I'd guess that it was some type of fun kitchen store. I will admit that they're kind of a nightmare to clean, but it's worth it! And supper was DELICIOUS, by the way. Wow I'm a freak for weird gadgets and I love pinneapple so that's awesome!